Every day and every waking moment, babies work at figuring out how the world works and they work in their world. From babbling to chatting; from rolling to running; from stacking to building; from my turn to your turn: these are a child's first real-life learning adventures—adventures that lay the foundation for all future learning. These are eebee moments, the basis of the learning that lasts...for every baby, with every parent. Click on a picture to find out what these babies are doing from a developmental point of view and why these moments are eebee moments. I wear shoes; mommy wears shoes. But when I wear mommy's shoes, it's funny because I know they're not mine ...and I like the challenge of walking in them. The importance of this moment: experts say that the understanding of self and other is the foundation of social intelligence. A strong sense of self coupled with acute social awareness—the ability to see the world through another's eyes (or in this case, shoes)—are critical skills for success both at school and in life. I can fill this thing up and dump it out — toys are in, toys are out, things are over and things are under...let's see what else I can make happen. The importance of this moment: experts say that development of strong spatial and sequential ordering skills—how both objects and ideas fit together and relate to one another—are essential for understanding patterns that make up such symbol systems as letters, numbers and shapes as well as developing strong organizational skills. Joining the eebee moment: While your baby is working on the logic skills in this play scenario, it's a great time for building language skills, too. Rather than asking questions that the pre-verbal child cannot answer, just narrate your baby's actions: “You dropped the red block into the bowl...there goes the green ball...and boom! There's the pink cup. It fell onto the red egg!” Without interrupting your baby's activity, if there's a natural place to participate, take a turn and drop one of the objects into the container—use sound effects, be silly, and describe what's happening. Your child, most likely, will enjoy your participation, anticipate your next move, and may even offer you things to drop in—making this exploration into a social exchange. If I hold the bowl with two hands and tilt it this way, I can pour what's inside. I'm pouring it towards me so I can really see what's happening! The importance of this moment: experts say that sustained investigation of a material results in a deeper understanding and more useable knowledge about the real “stuff” in the baby's world. These types of explorations also can lay the groundwork for future fields of interest. Joining the eebee moment: filling, emptying and transferring stuff can lead to highly practical skills—how much of this? How little of that? Which bag, box, or toy truck should I use? Is this heavy? Light? Will it squeeze down? How does it move? Encourage the exploration by introducing tools (different size bowls, cups, funnels—the stuff doesn't stay inside; tall things, short things—it takes more to fill the tall one!) Talk about what's happening. And, if the grains of sand or rice (or the cup of water) ends up on the floor, appreciate that for infants, if they pour it back into the big bucket, “my sand” and “my water” will blend into that source and they will not be able to immediately “see” and understand what happened. Acknowledge what happened: “the sand made a little hill on the floor” ...and then set the limits: “sand stays in the container” (for water, provide a bucket to fill; for solid material, clear a space onto which the baby can pour). It looks like I'm just drumming, but I'm actually figuring out how I can make those big sounds. Wow. I did that! Where I should grip the spatula so that I can make those sounds again? The importance of this moment: experts say that using a tool to accomplish a goal represents an important problem-solving milestone. Using an object for something other than its intended use (a bowl as a drum, for example) also sets the stage for future creative and flexible thinking. 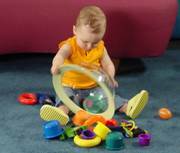 Joining the eebee moment: babies love to “make music.” Banging, knocking and clapping things together gives them a lot of information about the materials. To extend this moment, use another “tool” and drum along—hit the bowl at different points; point out differences in sound; put out other bowls of different sizes and materials (wood, plastic, etc. ); compare the sounds. Try making simple rhythms for your baby to listen to and imitate—remember, it's not a test. It's a discovery. Talk about what happens! When I pull this paper, I can make it come apart. I can make lots of little pieces. I'll keep doing it. See what I did? See how many pieces I have now? The importance of this moment: experts say that academic math skills are not the result of memorizing numbers and counting to 10. Rather, it's the intuitive understanding of the underlying mathematical ideas that come through play —more, less, next, many, few, bigger, smaller, etc. that lead to deeper conceptual understanding. Joining the eebee moment: Describe what your baby is doing—making smaller pieces from a larger one, dividing the big piece into little pieces, etc. As you narrate the process, use quantitative words such as “more” and “another.” When it appears that your child is finished with the tearing game, try crumpling a piece of paper and then stretching it out to model another transformation. Give your baby the paper (open or crumpled) to play with. Does she make it “smaller” or “bigger” or explore it in a different way? When I push this block, it moves on its side down the blue board. When I had a ball, I didn't have to push it...it just went by itself. The importance of this moment: experts say that babies are born natural scientists. Experimenting with objects and the materials they come in contact with helps infants to develop their scientific, logical thinking skills. Playing in this type of baby “physics lab” also helps to build an infant's knowledge base about how things behave in the world. I climbed up all of these pillows to get my ball, had to hold onto things to pull myself up, and even fell a few times. That's OK. The question is what's the best way for me to move back down? The importance of this moment: the world changes when an infant moves from crawling to walking. In addition to satisfying both intellectual and social interests, the infant must now coordinate those needs with controlling his physical movements. Exercising both fine and gross motor skills help the infant to be able to take on bigger and more complex mental and physical challenges. Joining the eebee moment: Any parent who has ever chased after a moving toddler knows that these children are goal-oriented and eager to use their newly formed locomotive skills. Help your baby to exercise those developing skills by creating some safe and simple “obstacles.” Create your own “pillow mountain,” or use pillows or other objects in the baby’s path that they can navigate around or pick up and move on their way to you. These types of simple games can be both emotionally satisfying and physically challenging. The importance of this moment: experts say that when a child reverses his actions and intentionally tries things another way, he is using higher order thinking skills. For the younger infant, everything just moves forward. The older child, however, is beginning to understand that moving forward may require taking occasional steps back. This simple reversal strategy can lead to putting information together in different ways and building new ideas—an essential element of a wide range of academic, creative and learning to learn skills. Joining the eebee moment: Playing with blocks and nesting and stacking toys is often a “quiet” and reflective activity for most babies. Simply observe what your baby is doing. If you like, describe what you see, “you put the blue block on top of the green block, etc.” Watch for opportunities to join the play by passing blocks to your builder or popping up from behind a “tower” or “wall.” Look to see if your child has a pattern in mind—if so, describe it, if not,talk about the size, height or length of a construction. This type of play is rich with “mathematical thinking” concepts. If your child is fitting things together, comment on the different sizes of and the relationships between the objects. Let your child figure things out—lend a hand if it’s a question of safety and assist or demonstrate how something works if your child appears overly frustrated or when the child invites your interaction.